The question by a local journalist was about whether France was going to strengthen its “support” for other African countries aside its former colonies where the majority of French aid is spent. Ghana won independence from Britain in 1957. After jokingly tossing the question between each other, Macron replied with fairly standard mundane rhetoric. 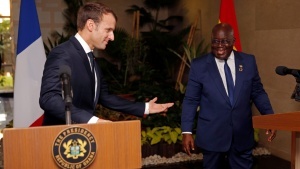 But when it was time for president Akufo-Addo to speak, knowing fully what he was about to say was controversial, he began by saying: “I hope that the comments I am about to make will not offend the questioner too much and some people around here”, the latter part widely interpreted as directed to his much younger counterpart. “We have to get away from this mindset of dependency. This mindset about ‘what can France do for us?’ France will do whatever it wants to do for its own sake, and when those coincide with ours, ‘tant mieux’ [so much better] as the French people say…Our concern should be what do we need to do in this 21st century to move Africa away from being cap in hand and begging for aid, for charity, for handouts. The African continent when you look at its resources, should be giving monies to other places…We need to have a mindset that says we can do it…and once we have that mindset we’ll see there’s a liberating factor for ourselves,” his rising tone and demeanor demonstrating his passion for this subject. Others have said, it showed the difference between Anglophone and Francophone African countries which are still closely aligned to France. For example, all of Ghana’s Francophone neighbors are members of the CFA franc, the currency of 14 African countries. The CFA and its structure, in which the countries, through two regional central banks, deposit 50% of foreign exchange reserves at the Bank of France in exchange for fixed-rate euro convertibility, are facing their most significant criticism in decades. Macron has defended the CFA, but only to the extent of pointing out that separate currencies would still need their own forex backing.